CLINTON: "We have the most dynamic, productive workforce in the world, bar none." Productivity fell 0.4 percent in the April-June quarter compared with a year earlier. That was the fourth time productivity has fallen from a year earlier since the recession began. Before that, productivity hadn't fallen since 1993. CLINTON: "It's true that too often, past trade deals have been sold to the American people with rosy scenarios that didn't pan out. ... I will stop any trade deal that kills jobs or holds down wages — including the Trans-Pacific Partnership. I oppose it now, I'll oppose it after the election and I'll oppose it as president." THE FACTS: She didn't oppose the Pacific deal when she was secretary of state, but rather promoted it. In 2012, during a trip to Australia, she called it the "gold standard" of trade agreements. She flip-flopped into opposition in the Democratic primary when facing Sen. Bernie Sanders, who was vehemently opposed to it. Clinton says she no longer backs the proposed trade deal as written because it does not provide enough protections for U.S. workers on wages, jobs and the country's national security. 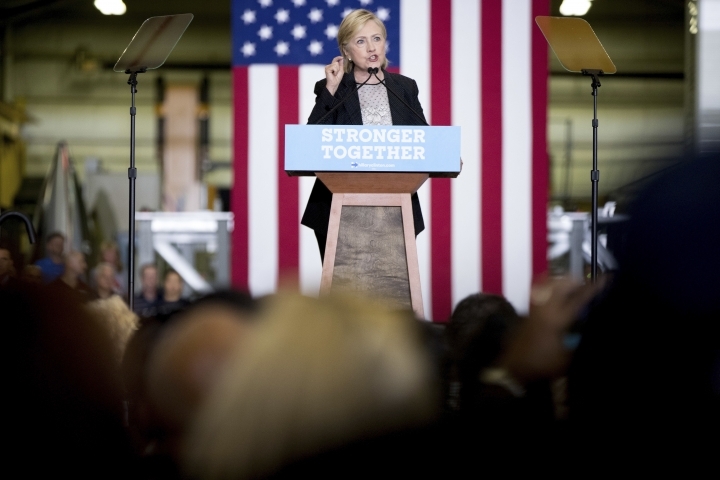 For years before that campaign, Clinton repeatedly defended the North American Free Trade Agreement, which her husband shepherded through Congress in 1993. As first lady in 1996, she said "NAFTA is proving its worth." As a New York senator, she said the agreement was good for the U.S. "on balance" and her 2003 memoir voiced the conviction that the deal with Canada and Mexico was the right step. While campaigning for the Senate in 2000, she also expressed support for her husband's initiative normalizing trade with China, despite her concerns about labor rights for Chinese workers. She said, again "on balance," that it was in the interest of U.S. workers to have China open its markets to more U.S. goods. CLINTON: "Too many companies lobbied for trade deals so they could sell products abroad but instead moved abroad and sold back into the United States." THE FACTS: This may be true, but it shouldn't have been a surprise. Most trade deals the U.S. agrees to, including NAFTA and subsequent agreements like the Trans-Pacific Partnership, include "investor protections." These are legally binding provisions that are intended to reassure companies that if they set up shop overseas, foreign governments won't be able to seize their assets or use regulations to hurt their businesses. Not surprisingly, many companies have taken advantage of those rules to shift their operations abroad. CLINTON: "According to an independent analysis by a former economic adviser to Sen. John McCain, if you add up all of Trump's ideas — from cutting taxes for the wealthy and corporations to starting a trade war with China to deporting millions of hard-working immigrants — the result would be a loss of 3.4 million jobs. By contrast, the same analyst found that with our plans, the economy would create more than 10 million new jobs." THE FACTS: First, Clinton persists in citing a former McCain adviser — the respected Moody's Analytics economist and forecaster Mark Zandi — without mentioning that Zandi is a donor to her campaign. He estimated her plans would add 3.2 million jobs to that baseline. She's taking credit for jobs expected to grow even if the economy were essentially on auto pilot. Further, the analysis Clinton quotes for Donald Trump was released in June, so it doesn't account for revisions in his economic plans, such as his intention to make the top marginal tax rate for individuals 33 percent, instead of the 25 percent analyzed by Zandi. Still, the outdated analysis says that there would be fewer jobs after four years of a Trump administration than exists today.